In my last article on 7th September 2017, we went through the basics of technical analysis. If you have not read that article, I strongly recommend that you read that first. Your basics must be strong before you master the advanced levels. Do take a close look and understand what is a trend and the different types of trends there are in the market. Ok now that you have understood what I was talking about in the last article, let’s proceed. Do remember we are still using a trend trading strategy, hence, any counter that we discuss must first be a trending counter. To ensure that it does not get too complicated I will only be discussing up-trending counters in this article. We will do down-trending counters in Part 3. You have an UP-Trending counter. You know that the price has corrected and is forming a lower high. But when is the right time to purchase a share? One way to do it is to use candlestick patterns. 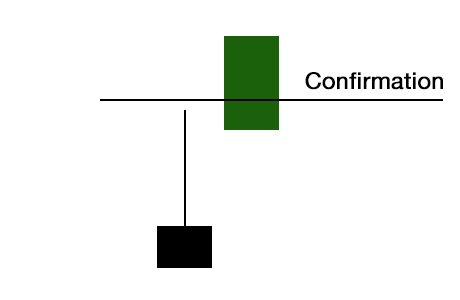 We will discuss 2 bullish candlestick reversal patterns today. Let’s use the historical price chart for DBS back in 2013/2014 to study these patterns. Please make sure you fully understand where we are at this point in time. Studying the chart below, we know that the trend has been confirmed with a low, high, higher low and higher high levels formation. At the next higher low (Buying Opportunity 1), which is also the correction in the price of DBS, we are looking for an opportunity to LONG the counter. It is in this area that we would like to see one of the two candlestick patterns. If the patterns DO NOT appear, please do not rush to buy! It’s ok to let the opportunity pass. There are 700+ counters in the Singapore Market and thousands in the US for you to look forward to. Do not get yourself stuck with just one or two counters. 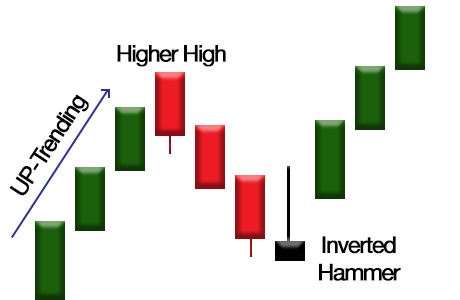 The hammer is a candlestick pattern that occurs after a correction in an up-trend. In the case of the DBS chart, hammers should appear at Buying Opportunity 1, 2 or 3. The lower shadow of the hammer must be approximately 2 times that of the body. The longer the shadow, the stronger the signal. It should have little or no upper shadow. It is important to understand what happens in the case of a hammer. Remember, in the last few days of trading, the sellers have been stronger and pushed the price down. Fear is getting into the market and more sellers will be pressured to sell their positions. On this day, after the opening bell, sellers flood the market to continue the downward selling pressure. After a certain period in the day, this selling pressure reduces and the buyers come back into the market to push the price up. In the case of a green hammer, the buyers buy it higher than the original price whereas in the case of a red hammer, buyers fail to buy it higher. In both, green and red hammer, it is a signal that buyers are back in the market. For sure, a green hammer is a stronger signal than a red hammer. However, having just a hammer is NOT a confirmation that the trend has reversed. You need a confirmation the next day to ensure that the hammer is valid. 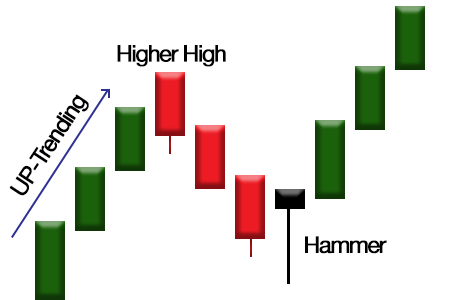 A confirmation occurs if the next candle trades above the highest price of the hammer as shown in the image below. This will also be your entry price. The difference between an inverted hammer and a hammer is that in the case of an inverted hammer, after the opening bell, buyers flood the market to buy and push up the price. 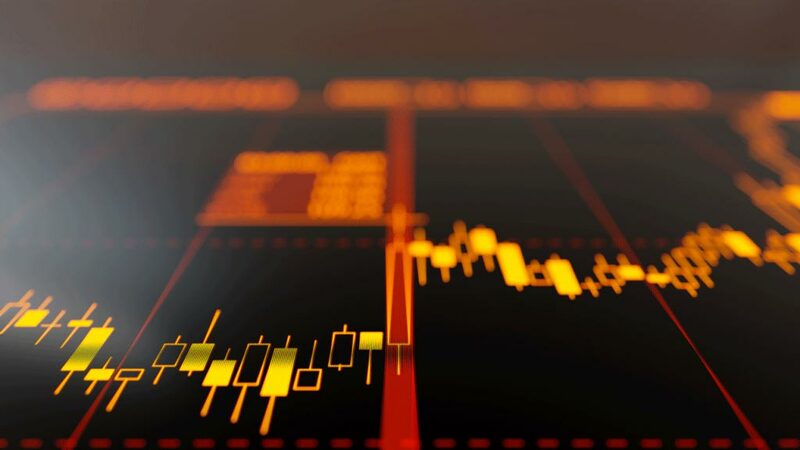 However, throughout the day, this reduces as sellers return and sell down the stock. 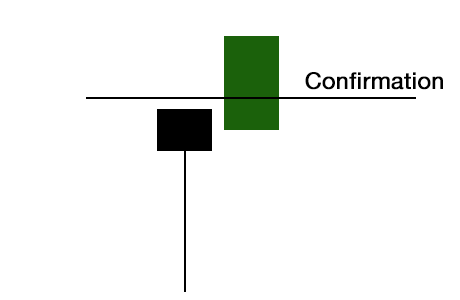 A red hammer indicates that sellers manage to sell the stock below the opening price while a green hammer indicates that they did not manage to sell below the opening price. Once again, a green inverted hammer is stronger than a red inverted hammer and both is a signal that the buyers may be back in the market. As with hammer, inverted hammer requires a confirmation which is also your entry price. That’s all for now folks. We’ll discuss bearish reversal patterns in the next article.